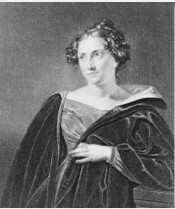 Catharine Maria Sedgwick of Stockbridge, Massachusetts, was a widely read novelist during her lifetime. She was the daughter of Theodore Sedgwick, a prominent lawyer, judge, and politician, and Pamela Dwight of the renown New England family. Persuaded to recall her “fragmentary childhood” in the late 1790s for her niece Alice, she began her Recollections with this paragraph. My dear little Alice,— … If you live to be an old woman, as I now am, you may like to rake in the ashes of the past, and if, perchance, you find some fire still smouldering there, you may feel a glow from it. It is not till we get deep into age that we feel by how slight a tenure we hold on to the memories of those that come after us, and not till then that we are conscious of an earnest desire to brighten the links of the chain that binds us to those who have gone before, and to keep it fast and strong. This is what she wrote about her education. The walking to our school-house was often bad, and I took my lunch (how well I remember the bread and butter, and “nut-cakes,” and cold sausage, and nuts, and apples, that made the miscellaneous contents of that enchanting lunch basket!). Works by Catharine Maria Sedgwick are listed here. The first paragraph of her memoir appears here. The description of her education is from In the Words of Women, pages 231-32.